These days, getting a positive message on the Right to Keep and Bear Arms from anyone at the federal government level is a difficult task. It wasn’t always that way, though. The Big Picture video below, presented by the US Army and featuring a second video produced by the National Rifle Association, preaches the virtues of focusing efforts on promoting safety training and emphasizing adherence to basic firearms safety rules. The idea that gun control laws do not have an impact on law abiding citizens – as they would obey the law and criminals, by their very nature, would not – is not a new one. 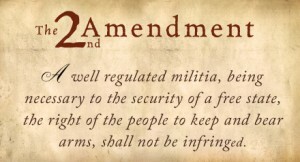 The history of the fight to preserve our constitutionally protected individual right to keep and bear arms has not changed much over the years. The narrator goes on to say that “a program that emphasizes safety procedures rather than firearms control makes it possible for a growing number of sportsmen and women to enjoy the recreation and healthful benefits of good sports and good shooting.” Developing rifle marksmanship skills through participation in shooting events such as the National Matches at Camp Perry is an endeavor that “helps develop healthy minds, self discipline, initiative and team spirit” – according to the government-endorsed video.